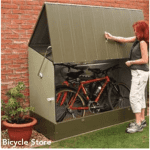 A high quality bike storage unit for a low price, use the opportunity to buy extras and you will have a reliable building that is very spacious and strong. This is a bike store and it has measurements that are 202 cm in width and 92.3 cm in depth. That width drops down to 181.4 cm internally and the depth reduces to 87.9 cm. That isn’t a massive drop in the depth but there is some loss in the width. The roof style is apex. This apex roof is a great addition to your building, because it will actively help reduce the impact of rainwater. Rainwater simply runs off quicker. 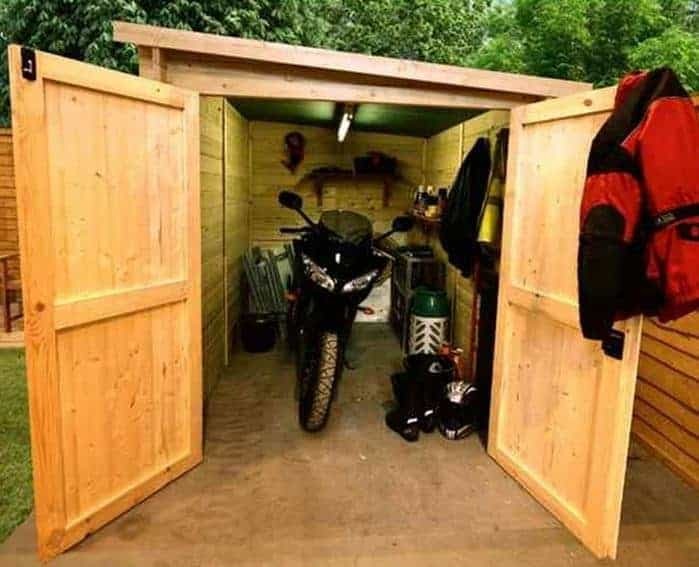 But the added height given with an apex roof also makes it a lot easier to store taller bikes. 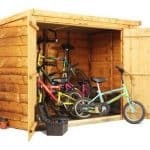 If you have a number of bikes in your home, including adult sizes, the apex roof makes storage that little bit easier. In that sense, it’s a good roof to have. The roof is made of solid sheet material. This is not ideal, and it probably is reflected in the price of the building. You have some mineral felt covering already applied to the roof, and this again means that you will be looking at some kind of replacement for the covering in the years ahead. You can’t really grumble we suppose, because the price of the building is so low, but just be ready for that additional expense as time goes on. Interestingly, the manufacturer puts more effort into other parts of the unit. For example, the cladding on this unit is of extremely high quality, especially when you consider the price. 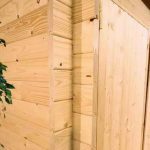 Tongue and groove cladding is exceptional, and it allows you to be safe in the knowledge that you have a strong outer shell for your building. 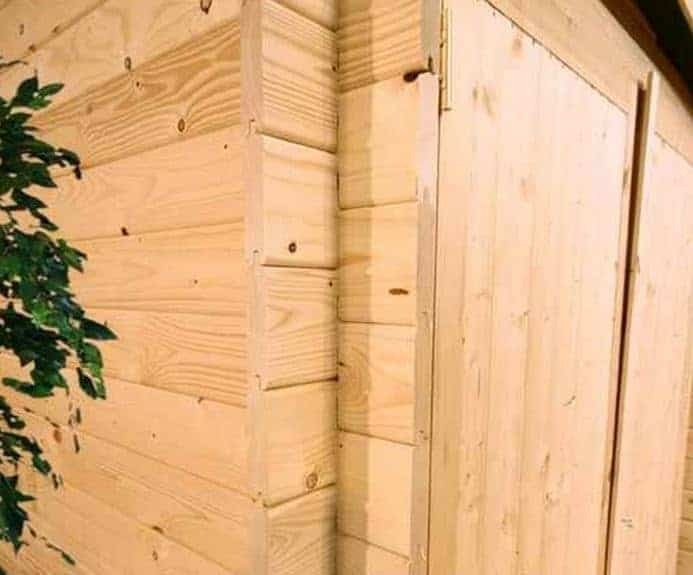 With timber that literally locks together seamlessly, this is excellent cladding to have on any building, never mind one that costs so little. There are flooring options given to you for the building, and we heartily recommend that you invest in tongue and groove flooring from the outset. This particular type of flooring is generally the best kind you can have, and while it doesn’t matter too much about water entry in the floor, you will find yourself with flooring that allows for heavier bikes and other materials, without any buckling or bowing over time. More good news comes in the form of the treatment that the manufacturer has already applied for you at the factory. This pre-treatment makes it a lot easier for you, because you have less cleaning and maintenance over time. It’s a robust start to the life of your building, and it means that you can be rest assured that your building is ready to take its place in your garden without you having to spend time treating it as soon as you get it home. 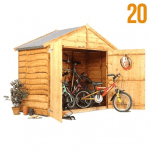 The high quality double doors open up to a respectable width, and this means that you can easily pull in a couple of bikes without any worries about damaging them on the entry space. These doors are very strong and we were particularly pleased to have that level of strength in such a low cost item. While the unit has a turn button for security, we recommend that you plan for the padlock and padlock protector units that you can buy as extras with this item. You are going to be storing quite expensive items and it makes sense for you to be able to keep them secure. We have already mentioned the fact that you can purchase a tongue and groove floor. You can also buy shelving as part of your customisation options, as well as colour your building to your taste. 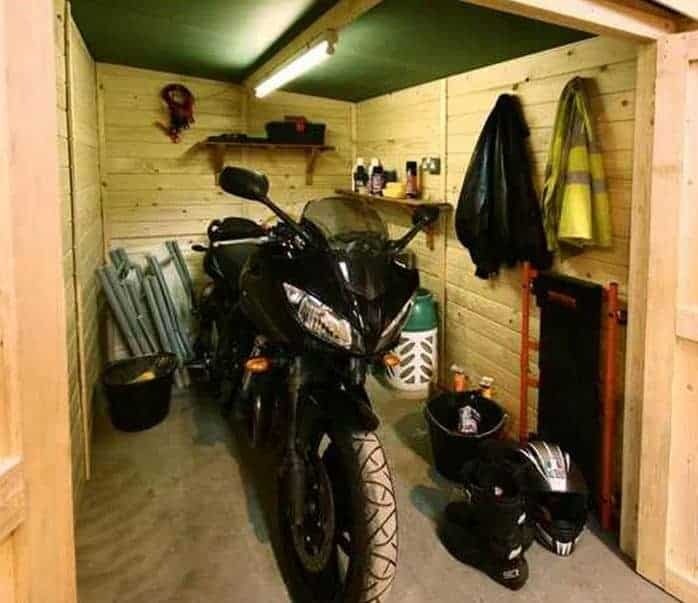 We recommend getting the shelving, because it’ll enhance the storage capacity of the unit, alongside the bike storage. The manufacturer saves the day on quality by offering customisation. This kind of makes sense to us, because the building is at such a low price point. We can’t imagine anyone grumbling too much about paying a bit extra for a quality floor, for example. As it stands at the base level, the building could have done with some extra care and attention put into the roof. The roof aside, you have plenty of longevity in that tongue and groove cladding. We recommend that you do your best to purchase the tongue and groove floor, and this will bring you a solid building over time. 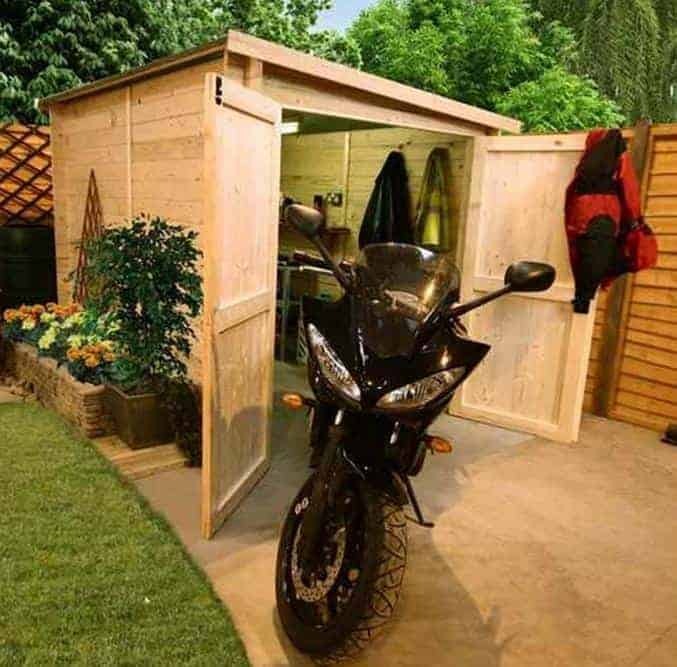 You can easily store a couple of adult bikes in this building without any worries at all. Add more storage with the shelves as customisation options and you have a very useful building indeed. You’ll find that this is very easy to put together, but we do recommend having a couple of people on the job. Nice and clear instructions, and they are very easy to follow. There is tremendous value for money here. Obviously, to get the best out of the building you will have to buy some extras, but even without them you get a lot of building for your money. Final Thoughts: This is an excellent bike storage unit. 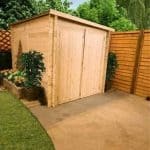 The roof is an issue, but not one that you will have to worry about over time. 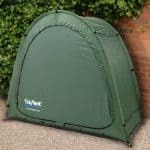 Useful and very practical, this is an excellent purchase.